Using a PIN to lock your Android phone will keep it safe from most people, but not from R2B2, a robot designed to brute-force its way through any four-digit code in less than a day. R2B2, the Robotic Reconfigurable Button Basher, comes from Justin Engler, a senior security engineer at New York-based iSEC Partners. The robot has debuted on YouTube in advance of its appearance at the Black Hat security conference in Las Vegas. In hacking, this method is known as a “brute-force” attack, but R2B2 is unique in that it exhibits brute-force behavior in real life rather than digitally. 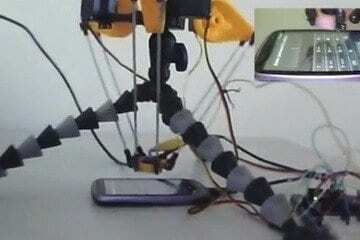 The robot — four yellow manipulators that control a central appendage, resting atop two “legs” — can sit atop an Android phone and simply press buttons over and over again. If a user enters five incorrect PINs in a row, the Android OS enforces a 30-second waiting period before the person can try again — but that is the only disincentive. This is actually the reason why R2B2 would not work on iOS devices: Apple employs an iterative system that makes a user wait increasingly longer to retry after each incorrect PIN.